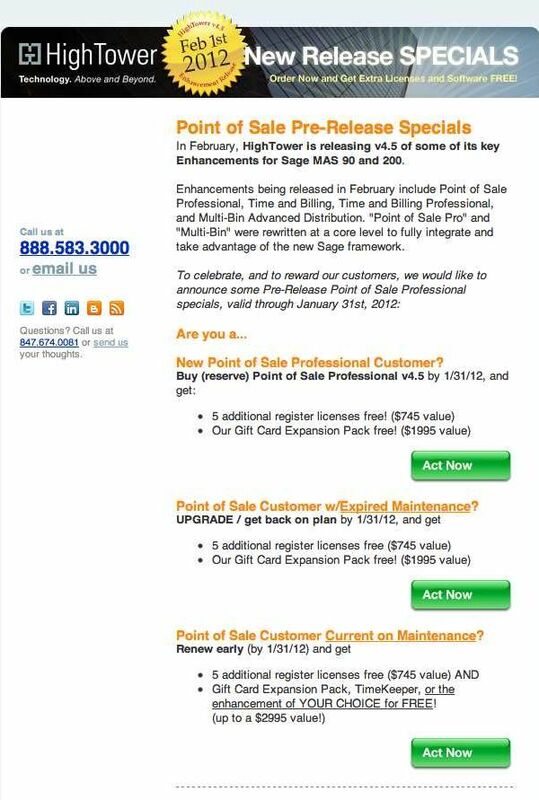 February 2012 brings an update for the Hightower Point-Of-Sale, Time and Billing and Multi-Bin Advanced Distribution. These enhancements are re-written for the new Sage ERP MAS 90 and 200 version 4.50 framework. New Point of Sale Professional Customer? Point of Sale Customer w/Expired Maintenance? Point of Sale Customer Current on Maintenance? Gift Card Expansion Pack, TimeKeeper, or the enhancement of YOUR CHOICE for FREE! Are you looking for a point of sale system for Sage MAS 90 or MAS 200? Here’s a quick review done by 90Minds member Bill Pfahnl based on an implementation of AccuPOS and MAS 90 that he was recently involved with. The integration link is straightforward and works with VI to import a daily sales totals for each till and an invoice in S/O Invoice Data Entry – all automatic. The invoice summarizes total sales for each inventory item along with the total money collected as the deposit amount for clearing later (tender summary) so the invoice should always be net zero. A special POS customer is set up for these invoices. 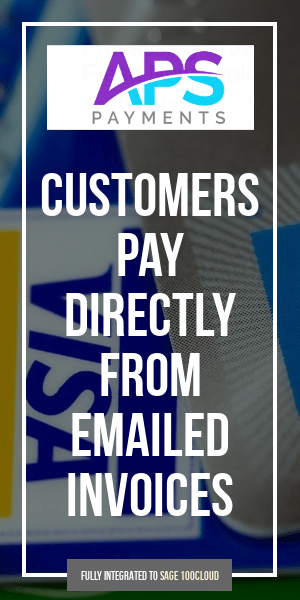 You can also sell to MAS 90 customers (with or without terms) and those sales will import as their own invoice. Accupos is an award winning Point Of Sale, Inventory Management and Time Clock solutions worldwide for users of QuickBooks, Peachtree by Sage, Simply Accounting by Sage, Sage MAS 90 and 200, and Line 50 by Sage. The software is a Sage Endorsed Solution which means it has been tested and verified by Sage and is marketed by them. Follow the link below to read more of Bill’s initial first impressions and see how he liked AccuPOS and the integration to MAS 90. Looking for a Point of Sale solution that integrates to your Sage MAS90 or MAS200 accounting software? Join the newest Endorsed Partner for Sage MAS 90, AccuPOS Point of Sale, and learn about the opportunity available for you to reach into the Point of Sale market without traditional challenges many partners face in the retail sector. Focused on cash and carry retailers and on restaurants, this award winning front end software uses the inventory of Sage MAS 90 allowing you to remain the expert in the product with which you are already familiar. AccuPOS has provided and supported Point of Sale for Sage financial management solution users for over ten years and we are excited to present them as our newest Endorsed Partner. From now until 3pm CDT on 4/30/09 users who’ve allowed their Hightower software maintenance to lapse can renew with zero back maintenance and zero penalties. This is a pretty good deal (actually very good) for any company who has let their maintenance go and now finds themself needing to be back on the plan so they can receive the latest software upgrades. Under the terms of the spring specials – users can get back on HighTower software maintenance with no late or lapsed years fees, new HighTower users can buy one enhancement and get one free and existing HighTower end users can purchase any additional enhancement at 50% off. HightTower Direct Deposit : Handles all direct depositing needs, following the National Automated Clearinghouse Association (NACHA) standards for Sage MAS 90 and Sage MAS 200 Payroll checks. HighTower Professional Retainer Control : Users of this enhancement can offer clients discounts on services by pre-purchasing blocks of time at lower rates! HighTower Point of Sale Professional : Allows stores to complete standard retail transactions while incorporating the data into their Sage MAS 90 and Sage MAS 200 accounting, distribution, and manufacturing system. HightTower Gift Card Expansion Pack : Seamlessly integrate Gift Card transactions with all the Sage MAS 90 and 200 modules through Point of Sale Professional (Requires Point of Sale Professional v4.2 or above). HighTower Time and Billing : Track employees’ activities on all billable projects and produce detailed billing invoices for your clients. Time/expense entry and invoicing features for law firms, CPAs, consultants, or any business that bills clients based on time. HightTower Time and Billing Professional : Track employee time for accurate invoicing and enhanced service to your clients, while increasing overall efficiency. Unlike the standard Time and Billing module, Time and Billing Professional integrates the Sage MAS 90 ERP or MAS 200 ERP Accounts Receivable module. HighTower Timekeeper for MAS90 : Enter time and expenses via Sage MAS 90 or Sage MAS 200, the Timekeeper Remote application, through your PDA device (Palm OS or Pocket PC), and/or via the Internet – the choice is yours with the Timekeeper module. HighTower Multi-Bin Advanced Distribution For MAS90 and MAS200 : Use MULTIPLE bin locations per item and warehouse with the Multi-Bin Advanced Distribution enhancement. Track an unlimited number of bin locations for each warehouse and inventory item. HighTower ScanBlaster : Effective and inexpensive bar code scanning solution for use with the Sage MAS 90 and Sage MAS 200 Bar Code module. ScanBlaster runs on most Symbol-branded or Symbol-compatible Palm OS devices with a bar code reader attached. HightTower MICR Encoded Laser Checks : Print laser-quality MICR encoded checks at high speed with low cost, optimizing the Accounts Payable and Payroll process. HightTower MAStransit : Export your MAS 90 4.x and MAS 200 4.x data to Microsoft’s SQL Server products for additional reporting options and efficiencies. HighTower RemoteXerver : Utilizing the XMLRPC technology, the RemoteXerver enables cross platform data sharing to and from your Sage MAS 90 and Sage MAS 200 system. Hightower Associates have just announced a new stimulus plan that’s designed to assist users of their software who may have fallen off the maintenance bandwagon. Under the plan, all prior year penalties (a 25% normal fee) are waived. All that a delinquent subscriber has to pay is the normal lapsed maintenance (up to two prior years’) plus the current year. This offer is in effect until March 31, 2009. 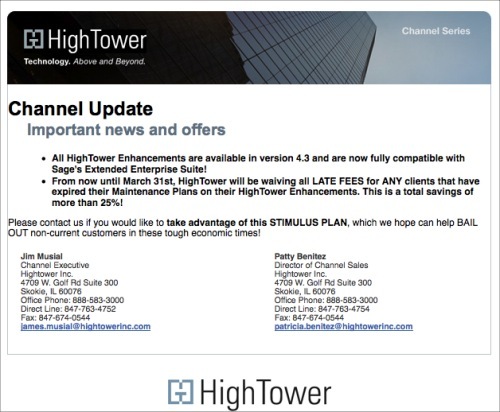 To take advantage of the stimulus, contact your Sage Business Partner or Patty Benitez (847-763-4754) at Hightower Inc. If you’re using the Sage Extended Enterprise Suite (EES) for MAS 90 or MAS 200, all of the enhancements that Hightower provides which are current at level 4.3 are now officially compatiable with EES.